We caught up with Edward T. Vieira, Jr. to discuss his exciting new textbook, Introduction to Real World Statistics. Read on for our exclusive interview with Ed and to find out more about his excellent new textbook and how it be can applied in your classroom. "Introduction to Real World Statistics is a useable and useful way to learn real world statistics." What lead you to writing the book? What are the benefits for instructors using your new book? What are the advantages of learning to use SPSS? Edward T. Vieira, Jr. is Professor of Marketing and Statistics, Research Director, and member of the Institutional Review Board at Simmons College, Boston, Massachusetts, USA. He earned his M.B.A from Bryant University and Ph.D. from the University of Connecticut. Currently, Dr. Vieira serves on the editorial boards of seven peer-reviewed journals providing statistical and methodological expertise. He has over 30 years of management, research, and consulting experience in areas such as marketing research, community outreach focus groups, organizational research, and education evaluation research. Introduction to Real World Statistics provides students with the basic concepts and practices of applied statistics, including data management and preparation; an introduction to the concept of probability; data screening and descriptive statistics; various inferential analysis techniques; and a series of exercises that are designed to integrate core statistical concepts. It is my hope that Introduction to Real World Statistics will inspire individuals to study statistics and all its pragmatic wonders. 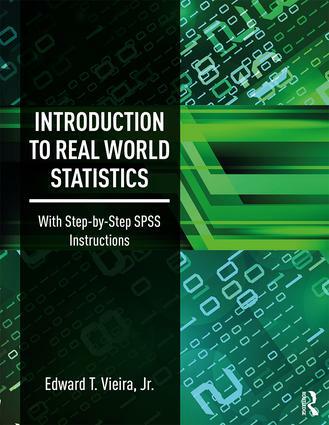 Introduction to Real World Statistics is a user-friendly book designed to teach students or practitioners the fundamentals of applied statistics. The text does not emphasize formulas, but the practical hands-on usage of statistics as a tool for improving decision-making through knowledge discovery. 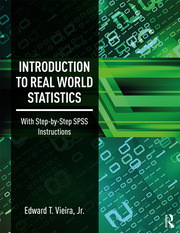 Each chapter contains a 'Real World Snapshot' of statistics applied in a concrete manner related to the chapter topic. The book covers the specific steps required to run an analysis using SPSS as demonstrated through a number of real life examples across many fields of study. The book systematically discusses most basic statistics procedures and notes others so that the reader can further explore additional statistical options. Additionally, end-of-chapter applied exercises and answer keys are provided as well as real world case studies and answer keys in the appendices. Online resources consist of PowerPoint slides for each chapter as well as the complete datasets for all examples in the chapter, end-of-chapter exercises, and case studies. The book includes an instructor test bank with questions in various formats; chapter PowerPoints; datasets and answer keys for chapter examples, end-of-chapter exercises, and case studies; real world snapshots in every chapter; SPSS detailed steps for running analyses; and additional information about quantitative research located in the appendix. Although my book provides a general conceptual framework including some light mathematical formulas, the emphasis is on applying statistics. In most cases, students or users of statistics must identify the statistical problem at hand. Second, decide on the appropriate statistical tools needed to tackle the problem. Third, successfully run the appropriate analysis. Fourth, interpret the results. Last, report or explain the results in statistical and in plain English terms. This book reinforces this process throughout the presentation of various statistical procedures. Keep in mind, one does not need to possess electrical and mechanical engineering knowledge in order to derive the benefits from automobile ownership and driving. The same holds true for producers and consumers of most quantitative research. One simply needs to use the tools appropriately and effectively. The benefit is derived from knowing that the results were arrived at accurately and knowing what they mean. SPSS is a tool that easily allows researchers to successfully implement the quantitative analysis process through a plethora of tools. More specifically, SPSS offers a wide-array of tools designed to address key statistical assumptions including determining the correct sample size, data screening, accounting for missing data, and a host of many other procedures including the ability to interface, access a number of add-ons, and customize analyses using many simple and complex statistical procedures from descriptive statistics to structural equation modelling. In short, SPSS is a user-friendly statistical application that meets virtually all of the quantitative analyst’s requirements. Well, statistics, and basic statistics in particular, is one of those areas where widespread innovation comes slowly. Although, there have been some intriguing developments relative to sampling, analyzing missing data, regression, and advanced modelling techniques, the noticeable innovations are occurring in the teaching of applied statistics. Some professors are exploring teaching statistics using a graphic novel approach, or, in the case of some of my mentors, using video games to teach the subject. With the relatively low cost availability of new and constantly evolving software and hardware, these are exciting times for pedagogy. I have three projects currently under development. First, I have plans to develop an introductory statistical textbook that largely relies on graphics such as images and flowcharts accompanied with text bubbles. Its focus is the visual learner. Second, I am developing an intermediate level statistics textbook, which drills down into the nuances and details of basic statistical concepts covered in an introductory textbook where topics like residual analysis is discussed in detail and various types of regression using categorical and/or continuous data and different methods of estimation are explored. Last, I have been developing a method for analyzing text content using network analysis. Through the usage of communication network principles, these measures combine the producer (messaging) and the reader (information processing) perspectives by examining not only word co-occurrences, but co-occurrences in sentence and paragraph structures so that larger linked clusters of meaning or themes can be discovered and the connections and strength of these themes can be studied to determine overall motifs.